At the Blackwell Law Firm website, we devote a page to distracted driving. The issue is also a frequent topic of my blog posts. 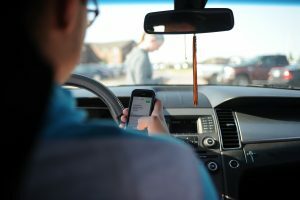 Why do we discuss distracted driving so frequently? We have seen far too many crashes caused by distracted drivers. Too many people suffer injuries resulting in chronic pain or long-term disability due to a distracted driver. Too many families lose loved ones in crashes caused by driver distraction. Because we have seen the toll of distracted driving, it is a subject we discuss frequently. In past blogs, I’ve discussed my belief — that crashes caused by a distracted driver are under-reported. We believe the reported numbers are too low for several reasons. In the aftermath of some accidents, police do not ask the drivers or witnesses about distraction. In other cases, the at-fault driver denies being distracted and no witnesses can refute the denial. Many times, the true cause of the collision is never reported. Now, a new study also indicates distracted driving is a factor in a much higher percentage of accidents than reported by government statistics. While I agree with the findings and think they should be discussed, let me first give the study caveat — It was conducted by a company that makes mobile apps. The company Cambridge Mobile Telematics (Cambridge) conducted the study. According to the company’s website, it is “the world’s leading smartphone-centric telematics provider” and makes apps which measure driver behavior. So, a for-profit company conducted the study in an area that benefits its business model. Do we simply disregard the study because of its source? No. But, we must recognize the background and potential biases of any study as part of a discussion. We plan to review the study in greater detail. Keep in mind — this study only analyzed “phone distraction.” While cellphones are likely the primary source of driver distraction, they are not the only source. In recent years, we’ve had accident cases caused by drivers distracted for numerous other reasons such as searching for items in their car, looking for songs on an iPod, and engaging back seat passengers. We have even had crash cases caused by drivers distracted due to more outrageous reasons. One case involved a guy who was both driving and watching a movie on a portable DVD player at the same time. Another case involved a guy who was both driving and looking in the backseat for his illegal drugs when the crash occurred. What we know in our office is practical. We see distracted driving accidents and injuries on a daily basis in our personal injury practice. Like many of you, we also see distracted drivers next to us on the highway — looking at their cellphones instead of the road and cars around them. We have cross-examined countless distracted drivers who tried to deny they were using a cellphone or other device instead of paying attention. We also know from our law practice handling defective products that our cars are safer now than decades ago. Yet, accident and injury numbers really have not decreased as expected. The numbers don’t reflect added safety. That’s because something else is keeping the number of crashes and injuries high. That factor is distracted driving. We believe distracted driving is a major factor in many disabling and deadly crashes. Because of this, we are committed first to helping our clients injured by a distracted driver. And, we are committed also to reducing and eliminating the dangers of distracted driving on our roadways. That’s why we so frequently write about driving studies, driver education and available technology. If you would like to discuss these issues, give us a call.